So another World Teachers Day has come and gone. All the build-up, all the excitement, and it just seems to go by in a flash. One minute we’re all hanging our stockings up in the classroom ready to be filled with gifts from our generous pupils, the next minute we’re all sick of spending the week eating leftovers from the big World Teachers Day feasts laid on for us by our families and friends. 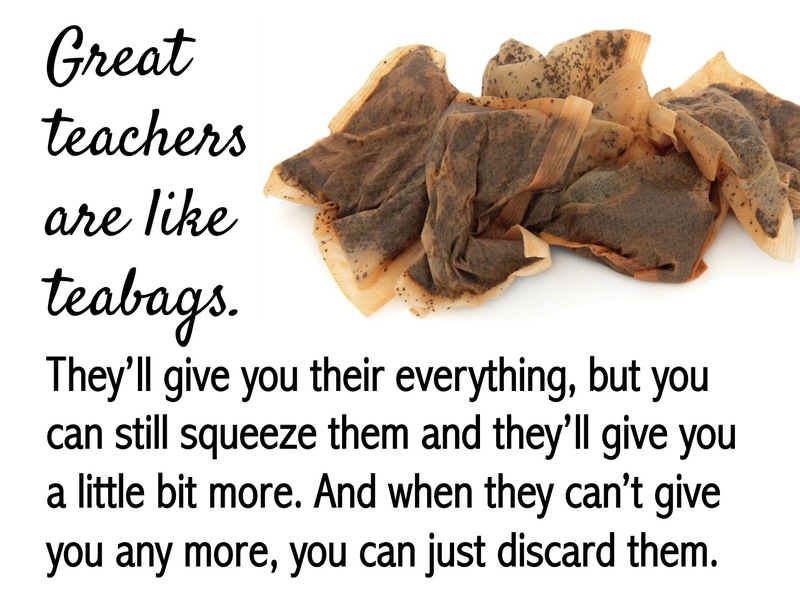 I love all of the traditions of World Teachers Day: chugging a yard of tea, the enormous full-sized teacher-shaped chocolate cake (bagsy the heart – it’s the biggest bit! ), marking under the mistletoe, pinning the grade on the lesson observation (blindfolded, of course), being allowed to go the toilet, the Airing of Grievances, the singing of teacher carols (“Mark! The Herald Angels Sing”), the Returning of the Glue Sticks, and – the best bit – all the inspirational memes. Quite often promoted by non-teachers, this trope says one thing: good teachers kill themselves for their jobs. The valorisation of teaching as a form of ritual suicide is subtle but pervasive. Once you realise it, you begin to notice it all around. It appears when the Chartered College of Teaching platforms speakers telling us that “teaching is a way of being, not just a job.” And it’s in motivational posters telling us that we should “give meaningful feedback on students’ work even if [our] pile of books seems endless”. 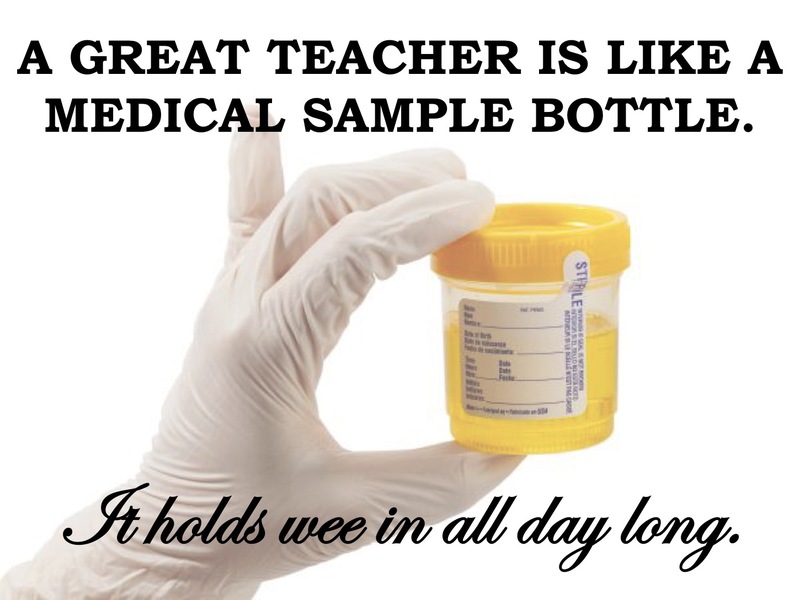 What of those teachers who aren’t prepared to give their whole self over for their job? Those teachers who put their family first or who want to have energy left at the end of the day for other interests? Maybe they should just accept the fact that they aren’t good teachers? If they simply won’t consume themselves to light the way for others, should they feel guilty? Why aren’t they prepared to throw themselves on the funeral pyre like all the other good teachers around them? The thing is that people don’t share these sorts of ideas because they want to attack teachers. The intentions are actually good; it’s just that such ideas are also completely unthinking. People assume that it flatters teachers: “anyone who is prepared to self-destruct just so that every child understands quadratic equations/oxbow lakes/pointillism is a truly an angel.” But this kind of hagiography actually damages teachers. It allows the system to tell teachers they should always be doing more. It allows the system to say: this is what teaching is; this is what you have to live up to if you want to feel you are doing enough. We really need to shift this narrative that teaching should be all-consuming and that self-destruction is part and parcel of our job. We can’t complain of workload issues at the same time as promoting this harmful shibboleth. Perhaps years ago I might have seen the ‘candle’ meme above and not noticed the deleterious subtext. I might have seen it as a celebration of our job. 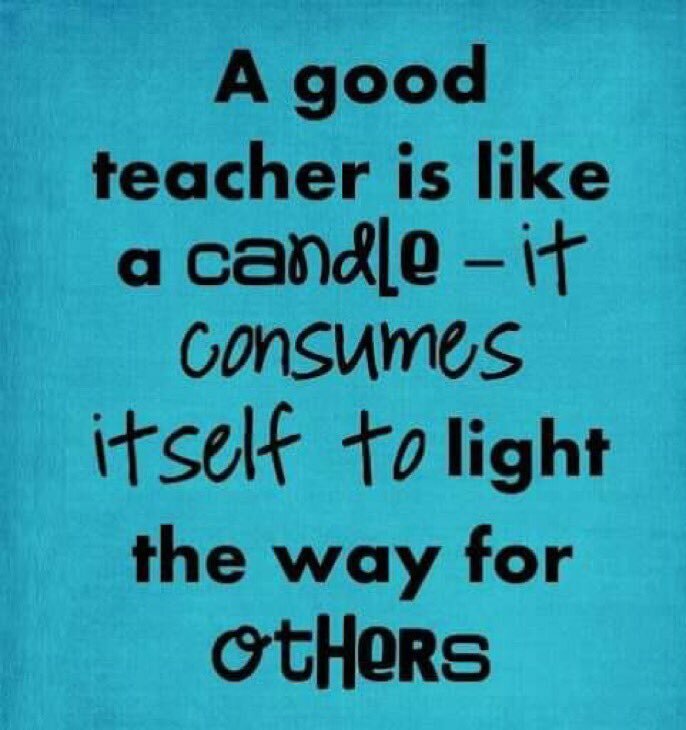 But after years of full time teaching, I realise how unsustainable this attitude is, how damaging it is. 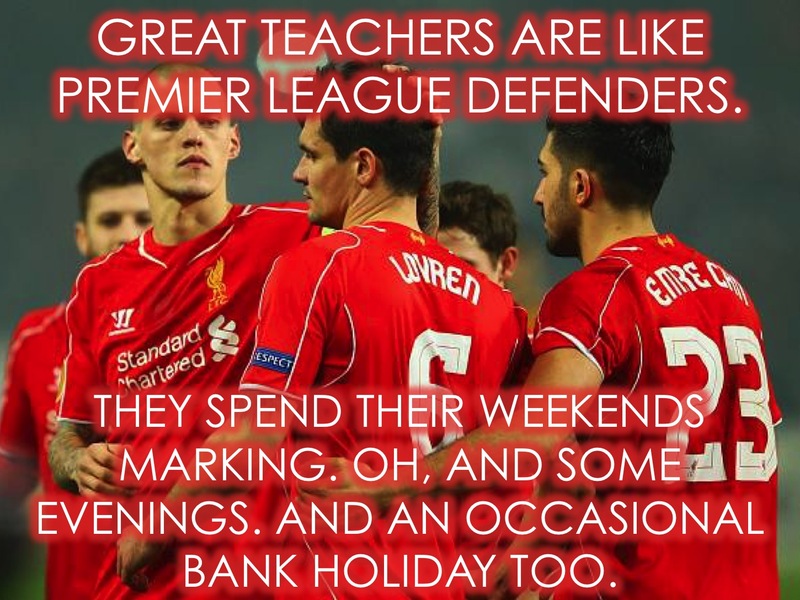 And this realisation means that I should probably throw away all of these old memes I made years ago when I thought I was celebrating teaching too. Silly, silly old me.